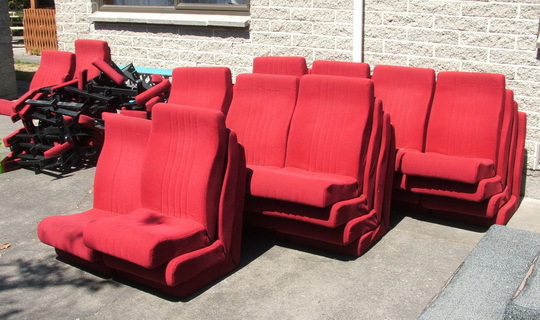 A few months ago my daughter told me there were a number of X cinema seats for sale on the internet being sold locally, starting bid $50. I thought "why not" and give it a go, thinking I dont stand a chance. My big surprise was a few days later I won it, 35 seats, for that $50 dollar bid. My wife went nuts what do you want those seats for?....well I blamed my daughter for putting me onto them....got to blame somebody . Anyway picked them up and as I suspected, they came from a local cinema closed and demolished from earthquake damage and it turned was the X manager, who later told me he went back only to find the projectors and eveything else being demolished. The wrecking people told him to take what he wanted, so he took as many seats as he could. 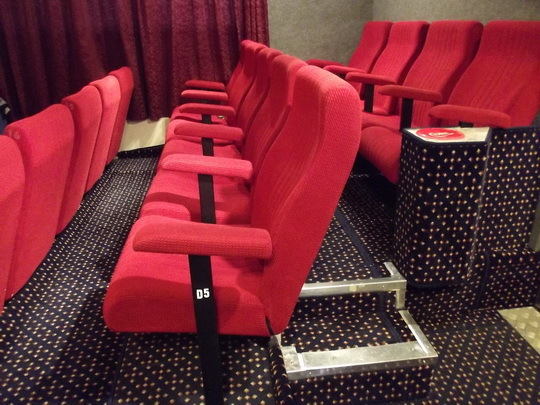 It was a real shame to hear from him what they did to that place "it was a really nice cinema"....anyway a few months ago I fitted some seats, the rest I hope to persuade a nearby museum to set up something and they can have the rest. 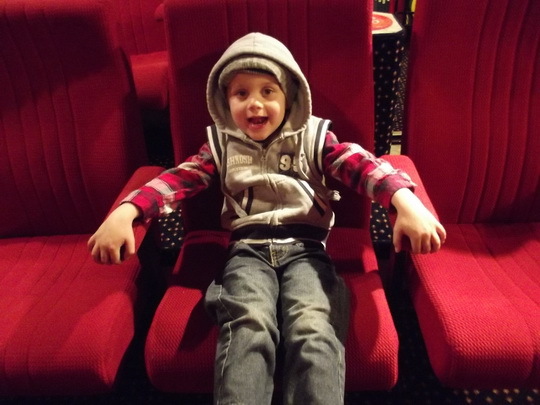 There you have it..old seats...old projectors...old projectionist....what next... retirement home for 35mm projection gear...if..
Graham,with your skills as a showman you'll be needing more of the same, going by the pic of young Connor, that's a happy patron. I love your story's. But still waiting for your video. Oh man, I would have killed to get a hold of the 35mm projection gates etc. The seats are great! Pat....the video, what was it? I cant remember I cant do much anyway the "camcorder" I had packed up...so thats that for a while. I cant help feel a bit sad that so much film stuff, projectors etc have been replaced by digital. Its certainly the end of an era. One new art house cinema has just opened here in the city, but its just "video projectors" no film at all In the future the only place you might see film running, will be in someone garage or home cinema. Its a shame in a way, there should be a small "working" cinema in a museum, or somewhere where folk can still get the "WOW" thats interesting factor. Well, I think most countries have a film archive that usually has a working cinema as a part of it. It makes me sad walking past our town's beautiful Art Deco cinema, that has been closed for the last 5 years as they can't find a buyer for it. Anyone got $900,000 they don't need?